I know it sounds weird but is there any way you could make mounts vaultable? My toons have 2 or 3 mounts in pack just wasting space. This is on our list of things to tackle! 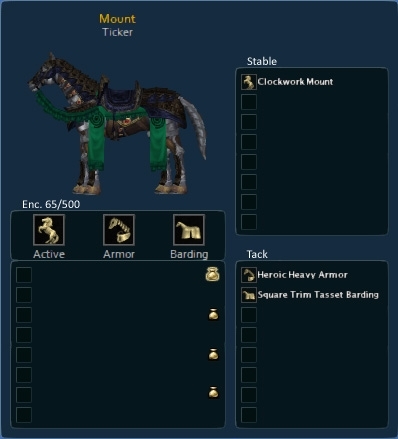 While allowing horses into vaults/house vaults is one potential solution, another one we’ve discussed is adding a (potentially summon-able) stablemaster NPC that will keep track of your available mounts. That would have the added benefit of your mounts not taking up any inventory (or vault) space until they’re needed. We'd love to hear your feedback on that idea or any other solutions you all might have! Mount encumbrance limit raised to 500. 8 inventory slots per saddlebag. 8 inventory slots for mount storage. 8 inventory slots for mount armor and barding storage. 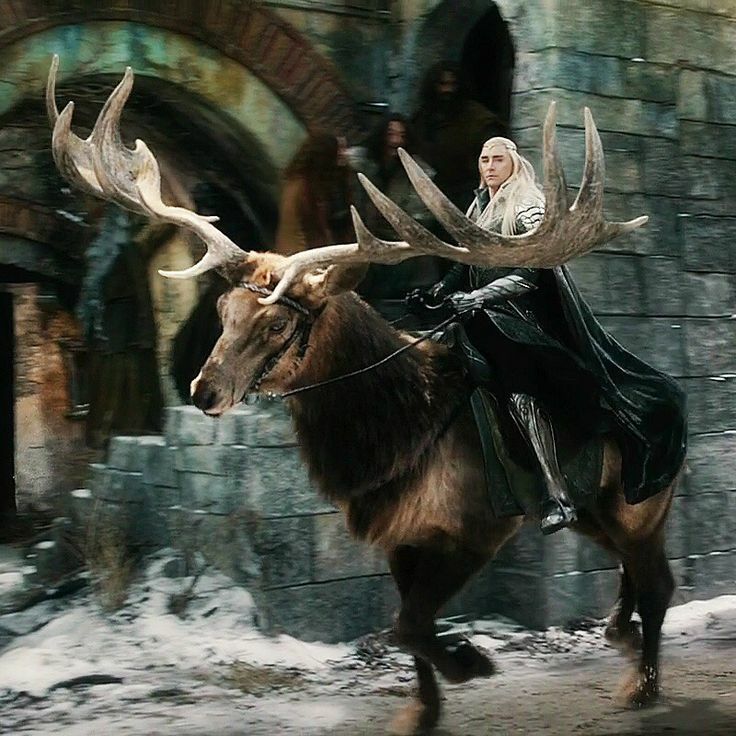 In addition, I have ideas... Crazy ideas... Each type of mount could give you a special buff while mounted. Eg. Fire horse gives you 100% fire resistance. Sure, any combat will dismount you, but a mount's special buff could blunt the effects of a first strike against you. Also, mounts with endo regenerating abilities would be very desirable for those long hauls. I hadda whole list of mount special abilities in my head but putting it here would probably be overkill.
" Mount Encumbrance raised to 500 " This would have been a good ideal before the /bank became available at any place in Daoc. I do however like your ideal about a " Special Buff". I also think if your on a mount you should go as fast as someone SPRINTING on Bard/Minstrel/Skald speed and sprinting. You should not need a endo pot to keep up while on a horse. Oh god, Here we go gonna have a horse with OP special ability and everyone will have the same mounts. Definitely don't agree with giving mounts diff abilities. I think mounts are fine. I just read the Grab bag with the initial question to make Mounts vaultable, and the idea of a stablemaster. I Think it would actually be pretty cool if u could add that kind of npc to ur personal House. With a small stable so u could "visit" the mounts placed in it. Similar things could be done for a guild House so that Members could Leave unused Mounts. Maybe even Share with others. 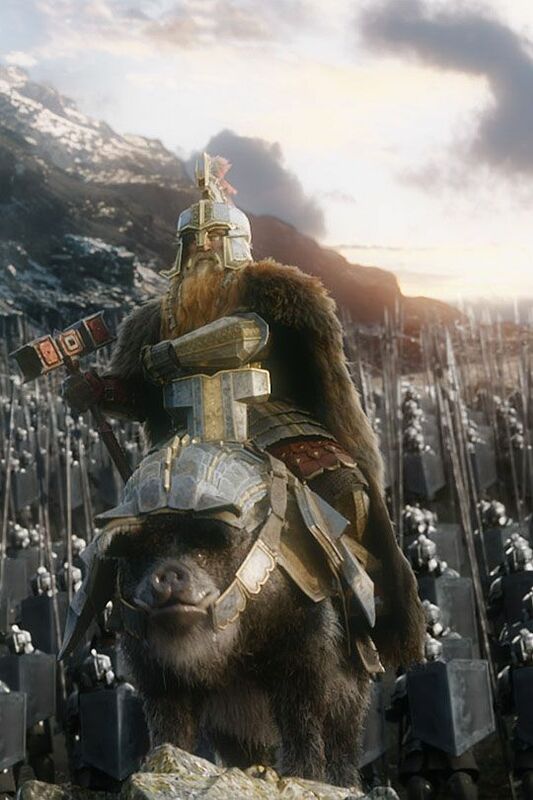 I don't feel mounts need anymore special abilities associated with them. That fact that coupled with armor you are at speeder speed is plenty enough imo. I'm always a fan of more storage so increasing the encumbrance level or saddlebag slots is fine with me but I won't lose any sleep if it isn't granted. The stable and tack ideas are good. I'm still not even sure horses should have 204% speed as is, never mind extra stuff. Thanks for the feedback, keep it coming! Out of curiosity, how many people actually use their mounts for more than the speed bonus? I can't honestly imagine anything more I'd like done with mounts. I get one, it makes me go fast without speed, and I'm happy enough. I had forgotten they even have pack space. As for special abilities - please no, at least not that effective just on a mount. This game is already jam packed with enough crap - nevermind having to think around some first-strike defense buff granted by a mount that's going to act as another bubble/defensive ability. Have my mount attend the Curse raids I can't due to work to get me gear - howaboutdat? I want a mount that I can ride underwater. DAoC already has all the shark riding animations, so I don't think it would be a big reach. I understand ppl not wanting another layer of things to worry about. Personally, I don't mind it... and I want to see the Mithril Merchant full of nice but inconsequential things to buy, at the very least. So, Broadsword, lemme buy special horse armor that turns my horse into a shark underwater! Speed, storage, and looks is what I use my mounts for and I'm content with that.
. I also think if your on a mount you should go as fast as someone SPRINTING on Bard/Minstrel/Skald speed and sprinting. You should not need a endo pot to keep up while on a horse. Agreed with @Sovereign and several others here. I think mounts are fine as is. Speed, storage, and looks is really all they are for and they provide this. I would not be opposed to more storage space, mainly because your bank can get filled quickly with deeds and other ramtdom ****. On a slight side note, it would be cool if the dragon mounts could fly in PvE zones. Would obviously not be possible in RvR zones, but no reason if you pay $20 for a mount that you shouldn't be able to fly in PvE only zones. How about being able to access saddle bags without having to summon horse? Messing with mounts brings up the question on speed. 1. It is rediculous that Thuerg/warden/RM speed is less than speed with a mount. Please just make those classes the same as other speed classes. 2. 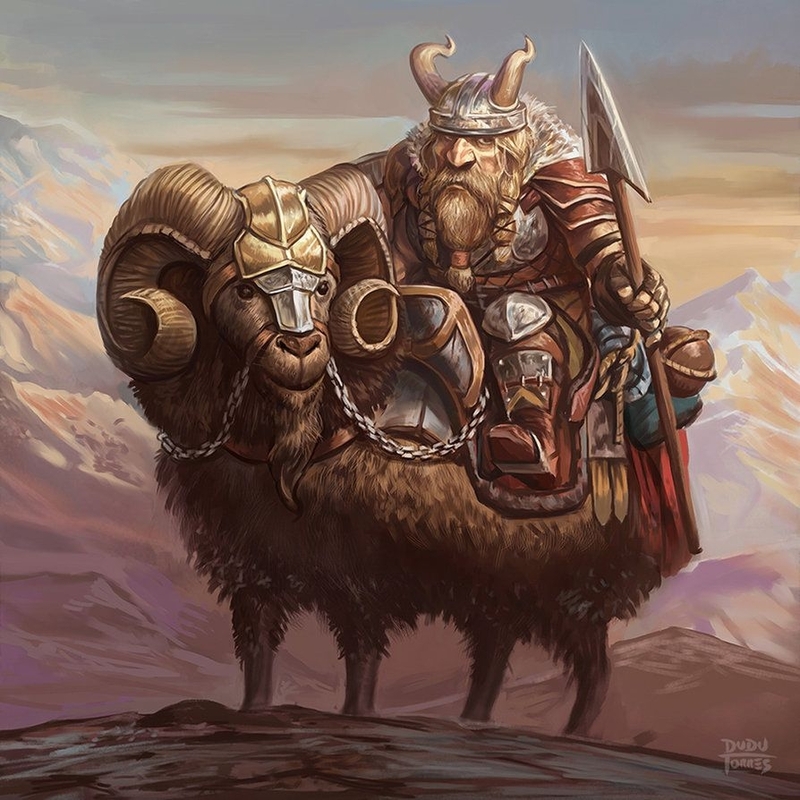 How about a different saddle, we have the one that give +54% speed, why not make it a trade off, you can have speed saddle or, a saddle with a small cart to have more slots/encumbered, you would then have a choice to have speed or slightly slower and pack more rams/siege to a keep take. I disagree. Not every single class has to have access to every single toy. You could argue that that has already been done via mount speed but the big difference is that once mount speed is disrupted, the user must then be out of combat and resummon the mount to gain access to that speed whereas the "caster" speed eliminates the summoning portion. Granting even more classes access high tier speed only further eliminates the need to have the original speed classes in a group. Add to that port scrolls and at least 2 of the realm's original speed classes become obsolete. @Sovereign I understand what youa re saying but wardens don't get groupped for their speed, and neither do Bards, Wardens get groups for heals and bard for CC, ROm's and healers are picked for DPS and CC/Heals, Thuergs and sorcs getting picked for DPS and CC and rupts. 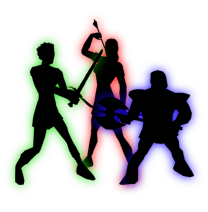 First off, when I talk about the original speed classes, I mean minstrels, skalds, and bards so wardens don't enter the equation in my argument. Second, I heavily disagree that bards aren't grouped for their speed, yes they probably aren't only grouped for their speed but back when they were the ORIGINAL speed class for Hibernia, they absolutely were grouped for their speed. If, today, they aren't grouped for their speed as a contributing factor that only proves my point that their original purpose has been lost amongst more classes gaining access to the same speed whether via horse or spell. Third, on the zerg level Albion has observed a severe decrease in minstrels due to sorcs being a more versatile option to the minstrel. So I feel your response that sorcs are grouped for their DPS and CC is not accurate. It's more accurate to say that they are grouped because they have access to DPS/CC/ and SPEED/Waterbreath which backs up my point again; that the more classes that have access to top tier speed further reduces the need to group the original speed classes. If you got groups as a bard only for speed, then you are not a good bard, they have always been grouped for CC, yes the original classes for Alb and Mid have seen a decline in groups for Skalds and Mins, I am not arguing that, that is why I ruled them out in my counter argument by stating that giving wardens and RM's and Theurgs cap speed doesn't make the origina speed classes any less obsolete than they already are. Mins are still a viable class with a proper setup, but Albs have always tended (but not exclusivly) been caster heavy groups, Skalds are still viable but I would think most heavily hit by the speed changes. My argument is for the 3rd gen speed classes it is stupid to give them speed at all if they can use an item to gain the benifit of a spell they already have, but better. If you got groups as a bard only for speed, then you are not a good bard, they have always been grouped for CC, yes the original classes for Alb and Mid have seen a decline in groups for Skalds and Mins, I am not arguing that, that is why I ruled them out in my counter argument by stating that giving wardens and RM's and Theurgs cap speed doesn't make the origina speed classes any less obsolete than they already are. Simply omitting Skalds and Minstrels from your rebuttal doesn't eliminate the fact that these classes would be made further obsolete. Mins are still a viable class with a proper setup, but Albs have always tended (but not exclusivly) been caster heavy groups, Skalds are still viable but I would think most heavily hit by the speed changes. Minstrel still being viable doesn't change the fact that they have lost significant numbers due to the sorc being a far more attractive option. Toss theurgs into the mix and forget it. You're thought seems to be, although granting top tier speed would further make theses classes obsolete that doesn't matter because it just doesn't make sense to you why various levels of speed exist. The rest of your reply is unnecessary and contributes nothing to the discussion. Since I can see this discussion beginning to devolve I don't feel there is anything to be gained by further discussing it. I'll just let BS read it and glean whatever they can from what has already been said. Your thoughts are "I'm not going to read this guys post because I'm smarter than he is and if I stil to saying the same thing it has to be right without acknowledging that he has the last comment which I still need to refute but can't so I'll also enhance my vocabulary to make a dramatic digital exit." Don't argue if your not willing to finish the argument. That just makes you a coward.. Damn, gonna write that one on the terlit wall.